This is the second of the USCG’s six (6) Great Lakes stationed 140-foot Bay Class ice breaking tugs to be drydocked using Great Lakes Shipyard’s new Marine Travelift. 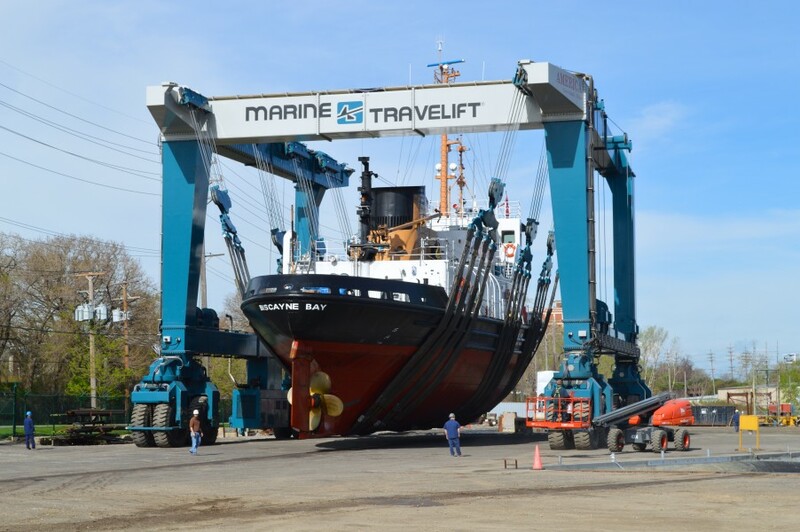 The Shipyard’s Travelift has also been used to lift one of the 150-foot Buoy Barges pushed by the Bay Class Tugs, and the USCGC BUCKTHORN, stationed in Sault Ste. Marie, Michigan. The Travelift is the largest on the Great Lakes in the United States and Canada, second largest in the Western Hemisphere, and third largest in the world. It was specifically designed and sized for Great Lakes Shipyard to accommodate the Bay Class Coast Guard Cutters and other vessels. Work on the BISCAYNE BAY is to be completed by late July. Great Lakes Shipyard is a full-service yard specializing in new construction, fabrication, and repairs of all types of vessels and barges.